in Germany you were always training, always waiting for the Soviet attack, Defending the Meinigan Gap, preparing to be rolled over by Russian steel. Most of us did not even know where Kuwait was, the news was unreal. not a joke to them. we trained for a fight we never thought we would join. And our day jobs, planning for that mythical Soviet invasion. from contingency units, all in desert uniforms. For Germany it was unity day, another reason to celebrate. Brave talk and quiet trepidation. Crew drills and reporting, practice for a serious future. we gathered for breakfast and an update. The SECDEF was preparing to announce additional forces. and were bitter sidelined for the big game. we were pulled off the bench. unprecedented, a forward deployed brigade sent to an active theater. The most painful, the destruction of the freshly compiled CONPLAN B, a year’s worth of work up in smoke. That war was over and we did not even know it. I have a faded color picture, we were young. we could have been listening to the Morrow Boys. letters from home, timeless on any front. then moved to the port to link with the battalion. exercises and training events, it all seemed so canned. Here there were no answers, only best guesses and estimates. What would he do? What would he risk? What could be won or lost? and at what cost? is there any chance victory on the battlefield? what is the value of standing against the infidel? The calculus is beyond comprehension. Almost civilization, soon we would leave that behind. of stale newspapers picked up two days late. fear of the unknowable, a Soldiers load. unchanging activities, apparitions of past wars. we trained and equipped a QRC. At echelon we were only guessing. Anything is better than sitting here…maybe not. acetate and markers, Je Suis Prest. one day closer to the breech. 36 hours and the ultimatum is placed. folded neatly in the appropriate SOP mandated pocket. We huddled in small groups, spitting tobacco, smoking, very confident, ready. 17 January, the war started with a massive air attack against the Iraqi Army. 0230 bedded, waiting for something to happen. Orders from higher break open their “ice packs” and assume MOPP 2.
ineffective, but a fearsome weapon. Guided in by a friend, we established at the forward CP. a sense of humor, approachable, a leader to emulate. He told us that we were going to participate in a significant operation the technology to decimate a people, subject them to our will and humble their leaders. options now limited, withdraw or defend. proud men and capable machines, all taking serious losses. F111B’s B52’s and A6’s were doing their jobs. their government is sacrificing her best. Supplies running out, mass defections. We are next in the fray. Look up, three B-52’s, a couple of fighters and a KC-135. powdered creamer swirls into coffee as the hood shakes. Eat MRE’s rest, read, try to understand. and the move up to Sidi Rezegh. kicked up by man and machine. We sat a few days prior, anxious waiting for the hour. The staff studied the problem and published orders. Soldiers sat on their tanks, played cards and wiped sand from tired eyes. In silence we shifted Marne patches left to right. Our commander broke squelch, he spoke of history, courage and combat. ink on acetate for weeks transformed to patches of dirt, and road intersections. scouts must have rolled through an ammo dump. Command push reports flank units breach unopposed. Sporadic Artillery and sniping but NSTR. Dark now, the wind picks up, heavy haze, light rain, moonless, a dark dream rockets streak, and scream. Late into early morning staffs plan and prepare for a dawn attack. FM crackles, RTO’s take notes. Republican Guard 78 KM to the east, real business just beyond the horizon. Two infantry battalions a tank company and a Division Command post. Our Marines are on the gates of Kuwait City. Massive prep on Al Busayaha, it looks like war. some killers play cards on the back deck. At 0630 prep shifts off and the infantry and armor roll through the town,it is over in three hours, 600 EPW’s. Tawalkana and Medinah, much depleted are next. DIV Arty (Gunner) closes in range. The target, the ADNAN Division, and Medinah Brigade logistics site. this is not Republican Guards. 27 Vehicles and crews destroyed in less than an hour. Second BDE was called forward to finish the job. beyond PL Libya and develop the situation. Iraqi Armor was fleeing, situation unclear. We were set to attack the best equipped Light Infantry BDE in their Army, with the most modern and best equipped Heavy Division in the World,overmatch, it did not last long. explosions seen across the front, concussion takes your breath. 27 Feb: PURSUIT: Black is on Phase line Spain. and one conducts the attack. We wait; it’s early in the morning on the 27th. No one has gotten any sleep. I just finished plotting newly reported positions of a Medinah Brigade. Confusing, no real formations, reports of company positions behind our lines. No one had a clear vision of the battlefield. Targets will be dealt with as they pop up. Gunner says it’s not him…20 injuries, none serious, no idea what happened. 0327, Phantom 6 says move, “pick up and move 10 km” report when REDCON 1.
we pass through the CAV at 0436. Some falls on Cotton, don’t know if it was 4-7 or 1-7.
we destroyed 3 tanks, type unknown, and 2 BMP’s. We were advancing quickly, than slowed to a halt as an engagement developed to our front. manned by a rear guard. the partial picture of a piece mill battle developed. Confusing and hazy as it always is. A flank unit, a sister battalion, 2000 meters left rear, observed the threat turret. designed with increased velocity and improved terminal effects screamed in locked on its target and penetrated the Bradley Scout Vehicle at 5700 feet per second. removing the leg of the Platoon Sergeant, and badly wounding others. Their battle is over, their fight just beginning. Stunned activity on the net, orders given movement, in slow motion. and hurry back with the causalities. Next afternoon, the battalion commander of our flank unit came into our operations center. A private meeting with the commander, departure after quiet regrets. 01 Mar: The war is over. 100 hours from the time the ground war kicked off. 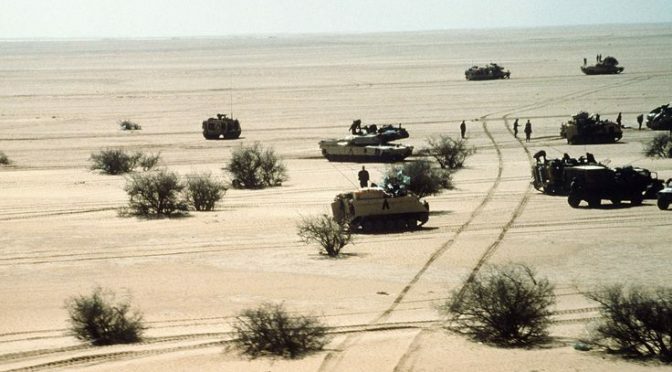 5 km west of Kuwait, in the Radaif Ar Rahsi desert. as intense as any I ever thought I would see. Iron Knight 2 does an incredible job 25 years after the fact capturing the moment, the Soldier perspective and the uncertainty and challenges that faced the 4-66 AR as it deployed to a place it never envisioned fighting. An incredible, honest accounting of warfare but a true American hero he repeatedly sacrifed over the course of his career. I am proud, very proud to know him, and thankful to be his friend. I am a veteran of Desert Storm, it may not be a righteous war but our troops fought well.